While there are many references available relating to the allowable spans of structural framing, the TimberLogic Span Table Reports (STR) are tailored specifically to the materials that are included in your standard framing package(s). This report includes options for lumber, solid timber, log, built-up and glue-laminated beams. The STR provides in-house staff with guidelines for estimating and design in a single reference document for consistent specification that can simplify plan development and resulting material lists. This report can show outside engineers and building officials why certain size timbers are used in plans. With full substantiation in the report for load development, the document is as useful for building officials and reviewing engineers as it is for estimating and design staff. Employed in estimating and design, the tables can reduce in-house change orders caused when design corrects a beam size from the estimate. Providing this report to outside engineers and even building officials can ensure that any changes they request will be according to your material specifications. Section 1: Members Used in Framing Systems – design stress values, section properties. Section 2: Load Criteria – live and dead loads applied vertically on the systems. 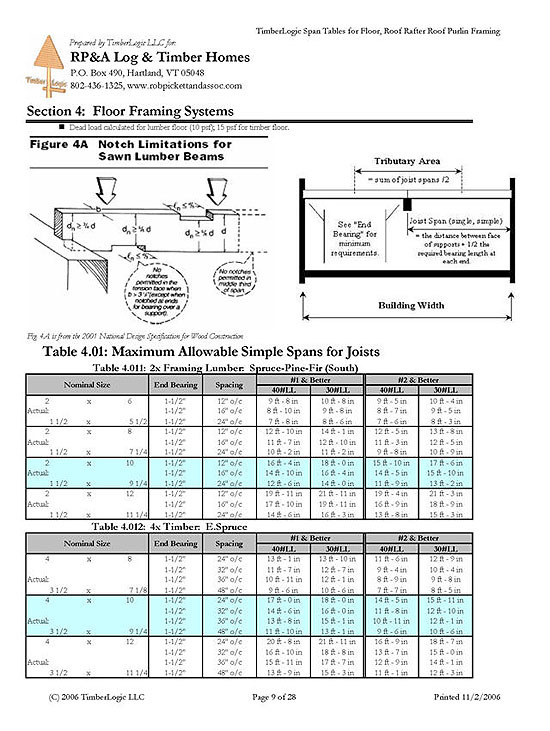 Section 3: Span Tables – Maximum allowable spans for T&G decking, floor joists, floor girders, rafters, ridge beams, porch lintels, hip & valley beams, and load capacities for timber/log posts.